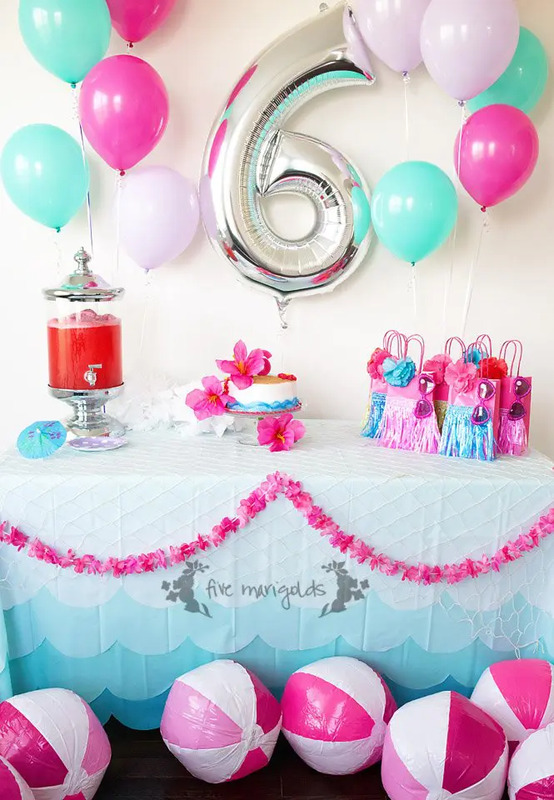 I’m back – with more birthday party inspiration! 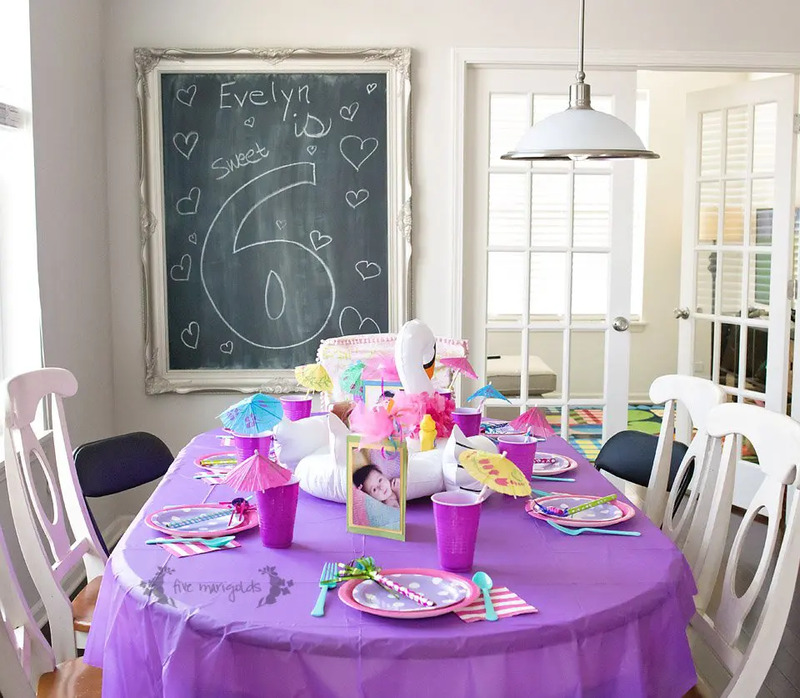 My big girl is turned 6 years old which means she got to have her first friends party – and has had her heart set on a pool party for, like, ever. She seems to have inherited the party planning gene, dictating #allthethings that had to happen for her party. 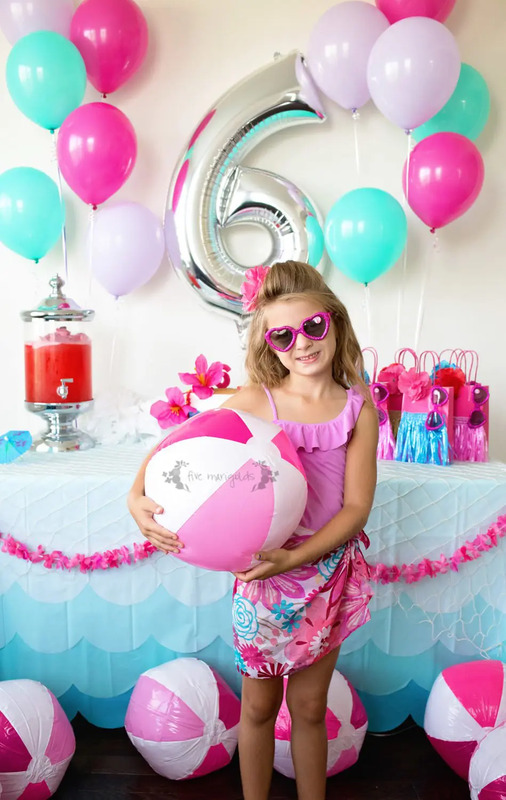 Her favorite colors are bold and bright, so the theme morphed into a Malibu Barbie inspired vibe. My favorite tip for creating a custom look is creating an eye-catching tablescape that guests will see when they enter the party. This whole tablescape was set using inexpensive supplies that, when layered, created a big impact. One of my favorite tips for creating a custom looking cake on a budget is asking the good people at the local big-box bakery to bake and frost your cake smooth, for just $10-15, then add your own accents. For the price, it’s worth it to me to avoid baking and get the great shape and clean frosting that I am not able to recreate myself as professionally. 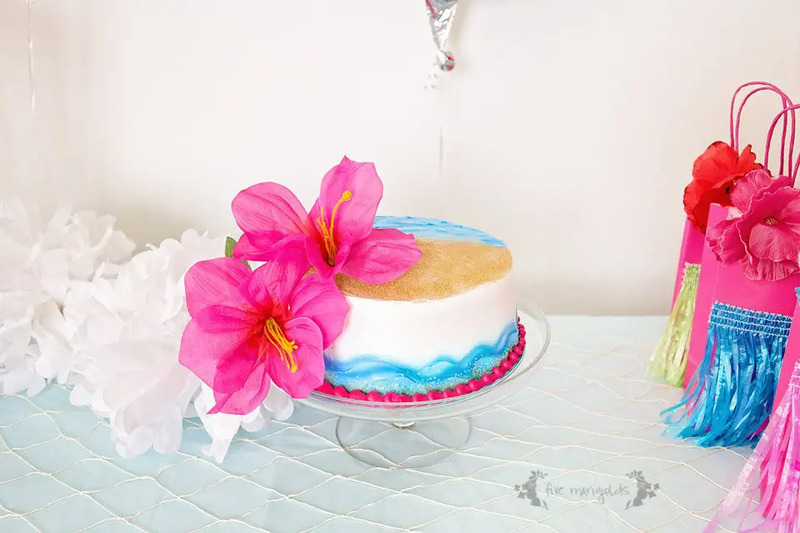 This time I asked them to create blue frosting waves and sugar “sand” so I could take this baby home and copy my favorite Pinterest inspiration using some dollar store hibiscus flowers. This strategy has some risk, though. 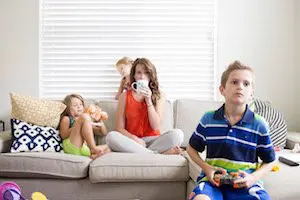 I was so bummed when I realized my vision wouldn’t be coming to life, but as my daughter told me as we walked out – it’s what’s on the inside that counts! So true, in both cake and life. Not only that, but she is big on flair and probably loved it more than my clean and classic vision. I’m a big believer that party favors should be enjoyed throughout the party to carry out the theme. I dressed up simple inexpensive paper bags with a few hula skirts cut into small pieces. When our little guests arrived, they were given their bag filled with a Flower hair clip, sarong (aka, dollar store scarves cut in half! ), and pink sparkle Barbie sunglasses – heart-shaped, of course – to wear throughout the party. 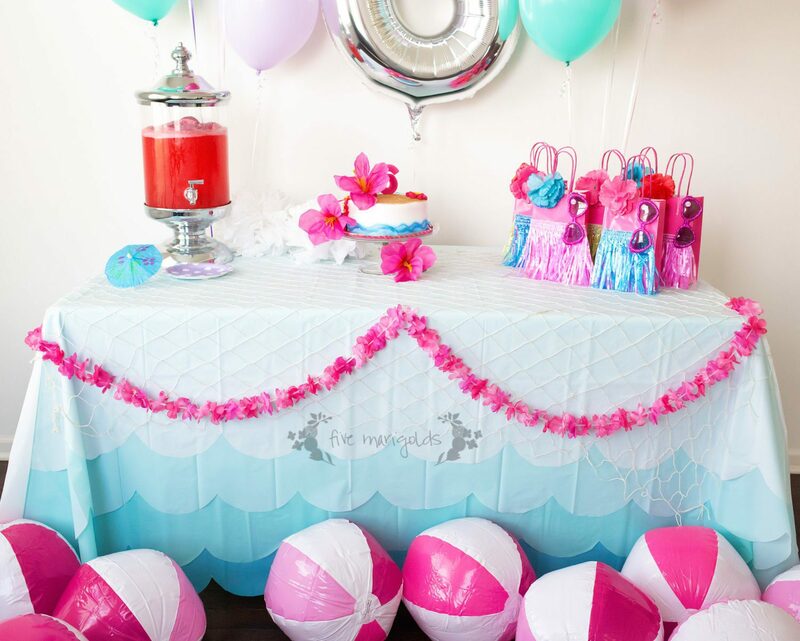 I’ve shared before that I love using party favors as decorations, which I did here with beach balls. I’d originally planned to add the packaged balls to their goodie bags, but then realized if they were inflated when they arrived, it would not only look great, but they could play with them during the party before bringing them home. When the kids were small, I invested in a few birthday supplies that I reuse year after year. 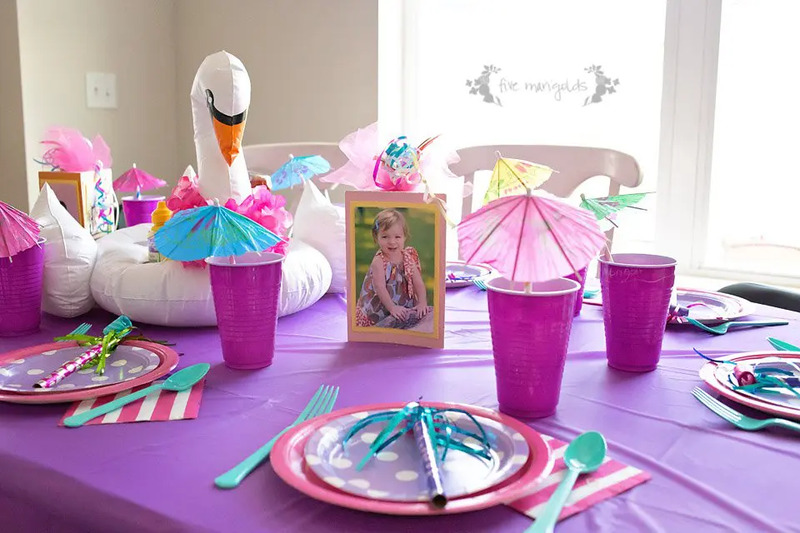 For example, I made some photo centerpieces when my girl was a toddler that I bring out each year – and guests love to look at. I generally keep the same color schemes each year and mix and match leftover plates, cups, utensils and straws from prior years. I carried the bright colors over to the table setting and served a simple lunch in berry baskets I had on hand. I also used my inflatable swan beverage holder for a condiment centerpiece, because why not? While out garage sale-ing this summer, I scored a tray of deeply discounted crafting beads that I knew would be perfect for this party. 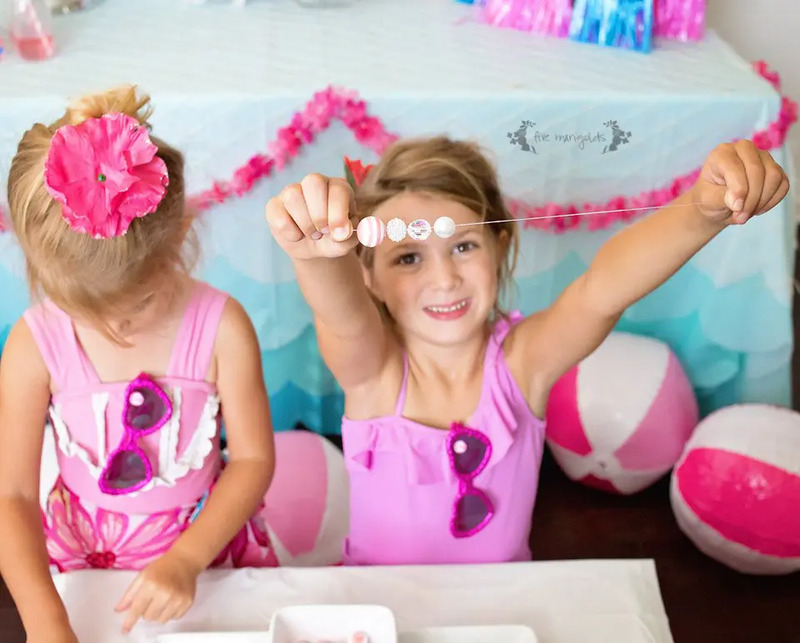 The girls took breaks from the main attraction – an inflatable water slide – to craft these sweet, bubblegum bead bracelets. Never one to recreate the wheel, I recycled the design I used for her candy necklace princess favors a few years prior, adding a hibiscus hair flower and thank you message to fit the theme. Psst…want to use these favors for yourself? Sign up for access to all of our free printables, here! A fun way to add a personal touch is to add an image from the party as part of the thank you note. I created a postcard featuring a group photo from the party, and used a fill-in-the-blank template that would be easy for my emerging writer to fill in herself. There you have it! 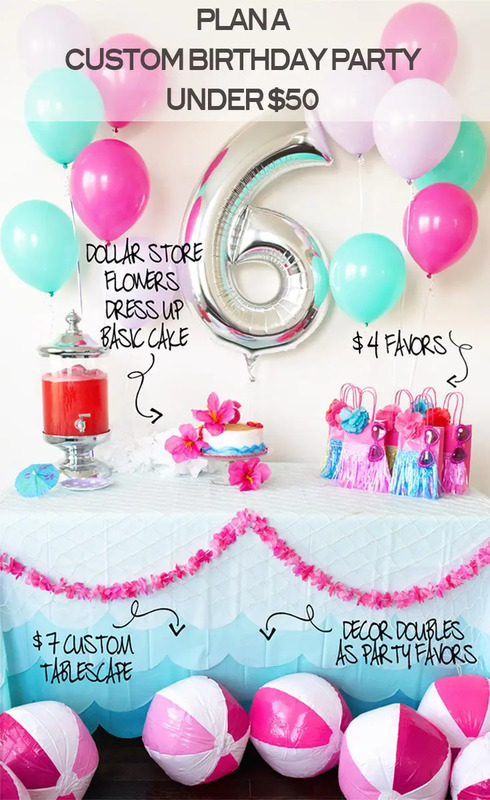 A custom-look birthday party for less than $50! 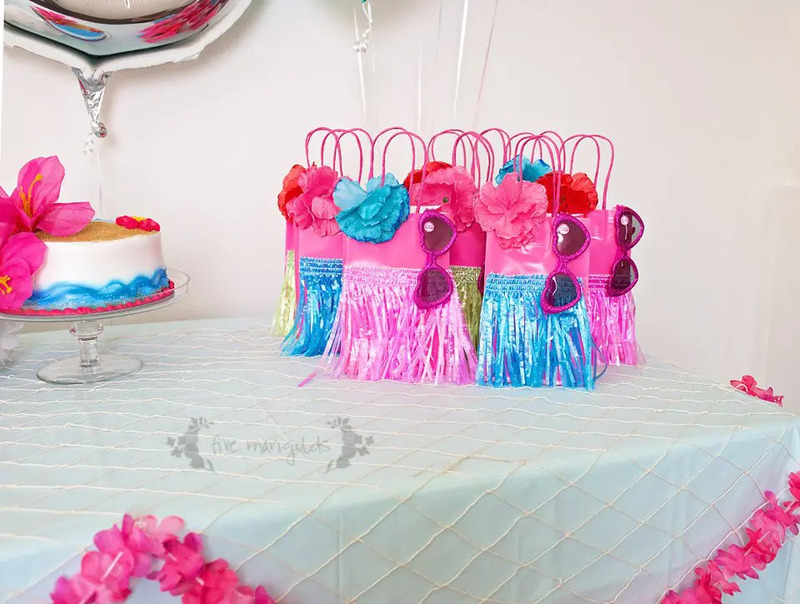 What do you think of our Malibu Barbie pool party on a budget? Let me know in the comments below! Such a fun party set up!! I love all the colors and the general theme!!! I love this!!! I’m stealing it for our next party! My daughter will be three and lovessss Barbies great job! OMG totally obsessed with this idea! So doing this for my girls! This is an awesome party! I have a little one with a late May birthday. This would be perfect for her one day! This is absolutely adorable! 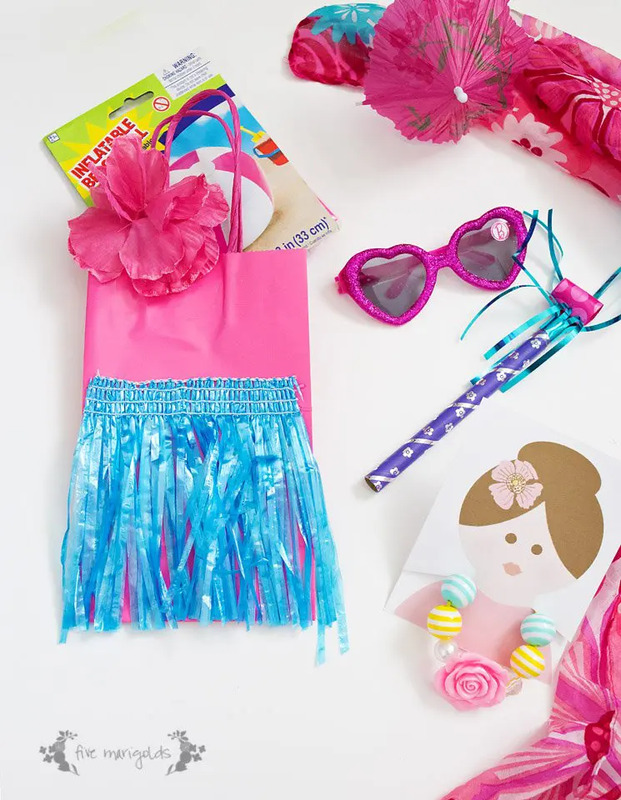 So many fantastic party ideas that every little girl would go nuts for! Sharing!! Loving this! Where did you find the variety of table cloths to accomplish the ombré? Hi Sully, thank you! I got them at Dollar Tree and Party City. Hello, I subscribed and wanted to print the note cards but wanted the ones with the flowers in the hair instead of princess. Can I get those? Hi Shere – of course! I’m so glad you pointed out that it wasn’t there! I’ve now added it so you can access that printable. Thank you! Hi , I have tried so many times to get back to the prin tables but I can’t find them. Hi! I love all your ideas! I was wondering where did you find all pink and white beach balls? The link that you have up has beach balls with other colors. Thank you! Hi Eva! (I love that name!) They must have changed the product at that link but I found these, as well: https://amzn.to/2MHEWeL. You can also try Party City – I remember when we threw this party they also had pink and white beach balls sold individually that were very affordable.